This is probably the day Apple and Steve Jobs have been waiting to see for a long time. They’ve predicted this all along and now their claims have been vindicated. Net Applications released their latest numbers regarding Operating Systems’ user base and the report is stunning. Apparently iOS is now the third most popular platform on the internet, surpassing Linux and Android combined. It’s something to take note of when a mobile operating system passes something that’s been around forever. Mobile’s growth curve is strong and mobile is becoming quite a phenomenon on the Internet. 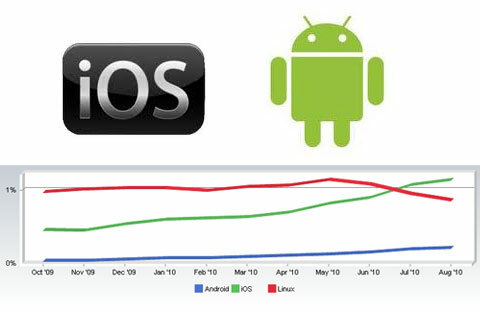 Cynics would argue the numbers but there’s no denying of the ever growing popularity of the iOS platform. iPad sales have added massively to the iOS market and iPhone remains the world’s favourite smartphone. If anything, the number of iOS users will only grow in the future, not the other way round. That's a misleading title and an absurd claim. What is their definition of User Base?